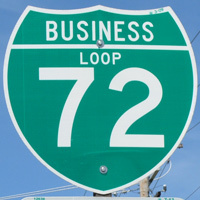 Business Loop I-72 at Jacksonville connects Interstate 72, which bypasses the city to the south along side U.S. 36, with the city along a 9.7 mile loop. The north-south leg overlaps with the U.S. 67 freeway from a full cloverleaf interchange (Exit 60) north to Morton Avenue (old U.S. 36) east. Morton Avenue forms a commercial boulevard east with Illinois 104 across Jacksonville to Mauvaise Terre Creek. East from there, the two routes separate, with Business Loop I-72 expanding into a four-lane divided highway to the rural diamond interchange (Exit 68) with I-72 & U.S. 36 outside the city limits. 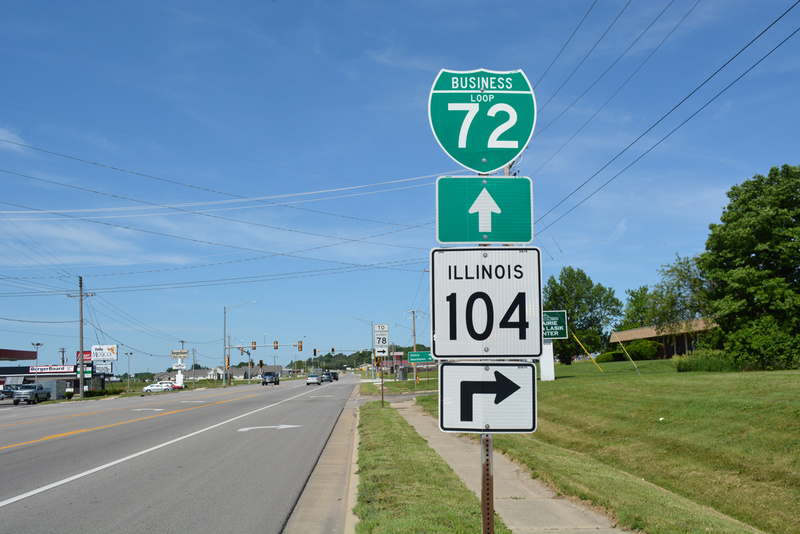 Business leaders in the Illinois capital city advocated for the signing of a business route from Interstate 72 in the mid 1990s. The proposal involved posting Business Loop I-72 along the old alignment of U.S. 54 starting at Exit 91 and lining Wabash Avenue east across southwest Springfield.1 This route was never posted. U.S. 54 formerly overlapped with U.S. 36 along Wabash Avenue east to MacArthur Boulevard north and Grand Avenue to U.S. 66 Business. The pair then took 9th Street north and Cook Street east to split at U.S. 66, which bypassed Springfield along an at-grade route on Dirksen Parkway. 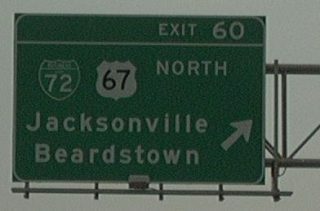 Guide signs posted along Interstate 72 & U.S. 36 east for Exit 60 and the concurrent section of Business Loop I-72 east & U.S. 67 north to the west side of Jacksonville. 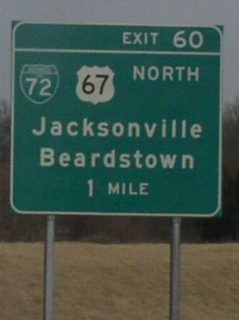 U.S. 67 constitutes an expressway south to Manchester and north to Chapin. These photos taken by Bill Burmaster (2003). Geelhart, Chris. “Interstate Business Route.” Online posting. 07 Feb. 1999. misc.transport.road. 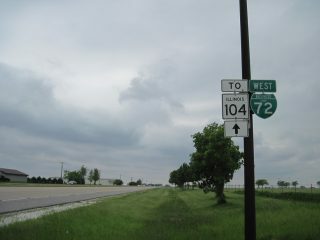 The first westbound shield posted for Business Loop I-72 appears with an Illinois 104 trailblazer. IL 104 crosses I-72 to the southwest, but without direct access. Photo taken 05/07/10. An end shield stands east of the I-72 & U.S. 36 underpass within the diamond interchange at Business Loop I-72 and Old Route 36 east. Bill Burmaster (2003).